I married into a family of former Ice Cream shop owners. 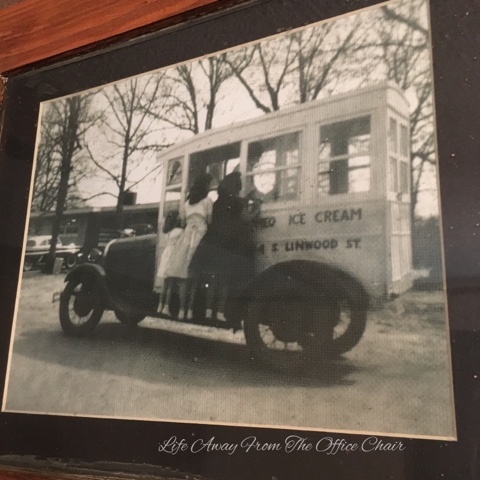 It was before my time when my Husbands grandparents came over from Italy and opened up "Dimeos Ice Cream Co."
It was closed in the 70's as I was just a tot. We have lots of memorabilia that I try to hang on to . From tiny ice cream spoons to vintage milkshake machines.. I will admit however, that im not a big ice cream eater. Its not that I do not like ice cream, I just despise the cold frost on my teeth and the chill I get when holding on to the container. Well, I had this bright idea to fix one of those problems so I headed over to Pinterest online to see if someone has already thought up the idea. The idea of an ice cream cozy. Sure enough, they were a few smart thinkers like myself. ha. 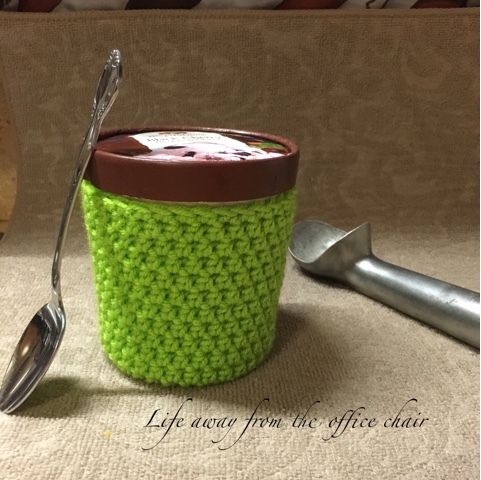 You curl up in your chair, turn on a movie, grab your blanket and container of ice cream. No more having to grab a napkin or towel to cover the container to keep your hands warm and dry as you indulge in some delicious cold yum yum . I found a free pattern here which was fairly easy and looks great on the cup but I just didn't like the way it looked around the bottom and it required more stitches that I had in mind. I wanted to come up with a more simple shape and form. And I did. Here is a look at my own version of the ice cream cozy. It didn't take me long to come up with my own pattern for this cute fuzzy sleeve to hold while scooping out the nuts and cherries from the ice cream. This will be another item I will be selling im my Etsy shop as I try to make some Christmas money. So, head on over and purchase one of these as I will be adding more as the weeks go by. I don't like it plain. I want it to have something in it. My favorite is butter pecan, rocky road or chocolate mint. I chew ice cream ( I guess that's why it hurts my teeth). I hate to hear people talk while they eat ice cream. I prefer a sugar cone over a cake cone. Id rather have a little scoop in a big sugar cone. and the very last bite of the cone is the best. What a SWEET entry and heritage. I love the ice cream truck. I can remember them. Not necessarily Dimeo's but in other southern towns. Chew Ice Cream? Ar you crazy, that would 'kill' me. LOL But Butter Pecan? AHHH my favorite food. YOU are one innovative chapess. No matter if someone beats you to it, there is nothing wrong with having your OWN original idea, then seeing it enforced by someone else. It is the creativity in you. I like that. And you just had to say Christmas!!! Haha...SO cute! I love it! Wow this is such a smart idea and I love the color of the yarn! Thanks for joining and sharing this at Cooking and Crafting with J& J. This is a smart idea! 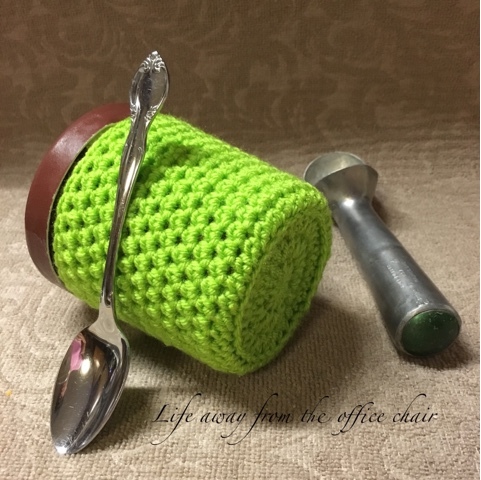 I don't like holding the cold cup of ice-cream, now I only need to learn crochet.